Sarah Gnieslaw started as a Brownie Guide (the equivalent of Cub Scouts) at the age of 8. She progressed to Girl Guides but quickly moved across to Scouts at 15th Brighton when she was 11. She attended two Jamborees, became a patrol leader and received the Scouters Award. 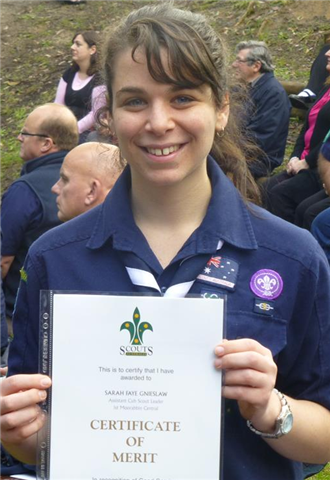 Sarah attended 28th Glen Eira Venturers and after taking a year off to complete year 12, returned to scouting as an Assistant Cub Scout Leader at 1st Central Moorabbin. Sarah led there for 6 years and during that time, received the Certificate of Merit for Adult Leadership in Scouting. She also received a Certificate of Appreciation by the Glen Eira City Council for her many hours of volunteer work in scouting over that time. Sarah took a break from leading to return to scouting as a youth member in the Rover Scout section. Together with others, she founded the only current Jewish Rover Crew in Melbourne: Harpatkah Rover Crew. She also contributed to the revival of the 3rd St Kilda Scout Group. Sarah became Crew Leader of Harpatkah RC in it’s second year of existence. During this time, she became an Assistant Scout Leader at 10th Caulfield where she has been leading for nearly a year. Now that her time as a Rover Scout is ending, she will undertake a new opportunity as the Akela (Leader of the Wolf Pack) at 10th Caulfield Cub Scouts.